Let me know over the “primary workflow,” which I’m defining as the workflow most responsible for the architecture. There are plenty of other valid workflows, but I’m not going to focus on them much here. The CAD user adds a file to Vault. 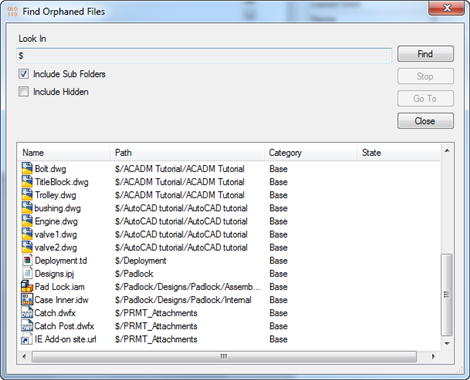 The CAD plug-in uploads a BOM object along with the file. I’ll refer to this object as the “file BOM”. The “file BOM” object gets stored in the database and mostly stays dormant. A Vault user selects the file and runs the “Assign Item” command. Internally, the “file BOM” gets read and becomes the template for creating or updating Vault Items. In other words, the “file BOM” fills out most the information in the Assign Item wizard. When the Assign Item wizard is complete, the Item objects are created and hooked together to form an “Item BOM”. The Item BOM is what user sees and interacts with in the Item Master. The “file BOM” is still around in the database, but it goes back to being dormant. It would only be used again if there is an update to the Item BOM or a need to re-create the Item BOM. There are some interesting consequences as a result of this workflow. The item structure has nothing to do with the file assembly structure. The file BOM is the only factor. The file BOM is uploaded, even if the product is Vault Basic. The idea is that the product may get upgraded to Vault Professional in the future. If the upgrade never happens, the BOM data stays dormant forever. The file BOM is not static data. It may get altered by the server. For example, data gets “filled in” during an Assign Item operation. This way things are optimized if the Items ever need to be updated. Results from GetBOMByFileId are not guaranteed to be the same, even when called on the same file version. See previous bullet. GetBOMByFileId is not actually used anywhere in the process. It’s an API-only feature intended for testing and troubleshooting purposes. And yes, I’m well aware that many people are using this function beyond it’s intended scope. Here is a quick rundown of the two different BOM representations. File scope Attached to 1 and only 1 file. Can be associated with 0 to many files. I created vLogic to be a useful tool in a variety of situations. It allows for customization without the overhead of a full-blown .NET DLL. A lot of people think vLogic is a good idea, but I’m not aware of it being use in any real capacity. As we all know, there is sometimes a big gap between “good idea” and “useful”. So I though I would spend a few posts taking a crack at some real-word problems using vLogic. Yes, I think I can do that with vLogic. Install vLogic if not installed already. Download the AddFilePost.SetToParentCategory.ps1 script and put it in the vLogic’s “Event Scripts” folder. The folder can be found at %ProgramData%\Autodesk\Vault 2013\Extensions\vLogic\Event Scripts with Windows Explorer. If “Base” is not your default file category, open up the .ps1 script and edit the value for $BaseCategory. Start or restart Vault Explorer. Set up File and Folder categories with matching names for cases where you want the script to run. This step is needed because categories can’t be shared across Files and Folders. Set a folder category and add a file to it through Vault Explorer. If the file goes into the default category, the vLogic script will assign it to the file category with the same name as the folder’s category. The script only works for files added through Vault Explorer. This script can only run on clients with vLogic and the .ps1 file. Project Thunderdome can be used to deploy them both to multiple clients. Here is the source code. As you can see, there is not a lot of code needed here. # This script updates new files not assigned a category are updated to match the category on the parent folder. # A manual refresh is needed to see the category change. The first Beta is out for the next release of Vault. If you do serious Vault development, you will want to sign up. There are some really nice features you will want to get your hands on. There are also some architectural changes that will likely affect your code. That’s about as specific as I can get on a public site. We can chat more about the specifics on the Beta site. Here is the invite link to get access. See you on the inside.